The Escapists 2 will launch on the 22nd August for Xbox One, PlayStation 4 and PC with a Nintendo Switch™ version to follow. You can even pre-order the game now via Steam and for PlayStation 4 and Xbox One from select retailers, with digital pre-orders available soon. Xbox One pre-order: Coming soon. PlayStation 4 pre-order: Coming soon. If you’re wanting to get stuck into The Escapists 2 experience ahead of the game’s launch on August 22nd be sure to check out our free Create-a-Con site that let’s you create the Escapist of your dreams, or even yourself, to use as a profile image or copy into the full game when it launches. Prisoners, those who pre-order will get access to an additional prison, The Glorious Regime! • 10 unique themed prisons to escape from including the frosty Fort Tundra, a train hurtling through the desert, and even a trip to the final frontier! • Drop-in, drop-out online multiplayer experience. Carefully plan and execute an intricate escape from your initial incarceration with your fellow inmates either online or locally, or simply hop into an existing game already in progress to help pull off the final touches of the escape! • New ways to escape . 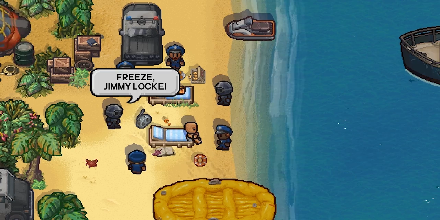 You’ve got a little over a month to round up your escape crew and get ready to escape the biggest prisons yet in The Escapists 2! Good luck, Prisoner. Aven Colony – Available Now On PC, Xbox One & PlayStation 4!